These H-alpha telescopes with 100 mm aperture and 800 mm focal length offer with an internal Etalon system a bandwidth of <0.7 Angstroms. Professional accessories such as Feather-Touch focuser from Starlight Instruments, sol searcher from TeleVue, and the new air-pressure tuning system “Pressure Tuner”, belongs to the standard equipment. Tube rings with dovetail plate and a robust transport case are included in the package. An instrument for the ambitious solar observer. 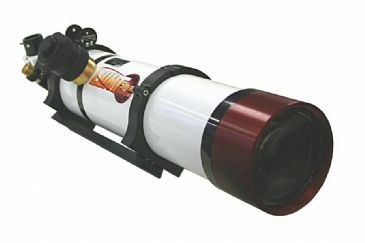 The LS100THa telescope is available alternatively with B1200, B1800 or B3400 blocking filter. We recommend the B1800 for imaging. The giant B3400 blocking filter in straight 2” extension tube is optimal for imaging with very big CCD imagers. Also with these large telescopes the double stack method can be applied to reduce the bandwidth. Front mounting an additional available LS100FHa H-alpha filter (article no. 0550400) on a LS100THa telescope will provide <0.50 Angstrom bandwidth. And that with full 100 mm aperture!